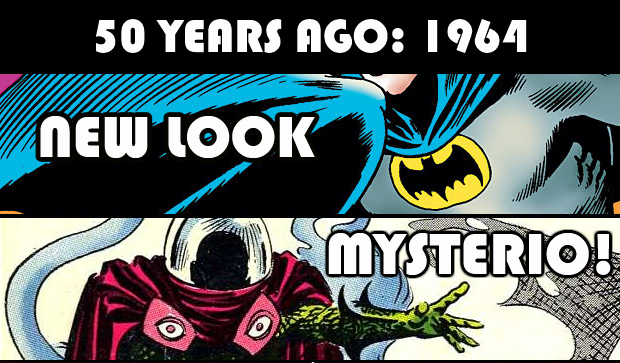 Taking a look back at ten, twenty-five, fifty and even seventy-five years of March comicbook anniversaries! SAMARITAN! As talked about in the Mini-Guide to the Guardians of the Galaxy post, the true start of the Marvel Cosmic renaissance began in Thanos #7, ten years ago this month (issue #8 also shipped in March). Keith Giffen would take over writing duties on the short series ending three decades of doing Marvel Cosmic the Jim Starlin way. 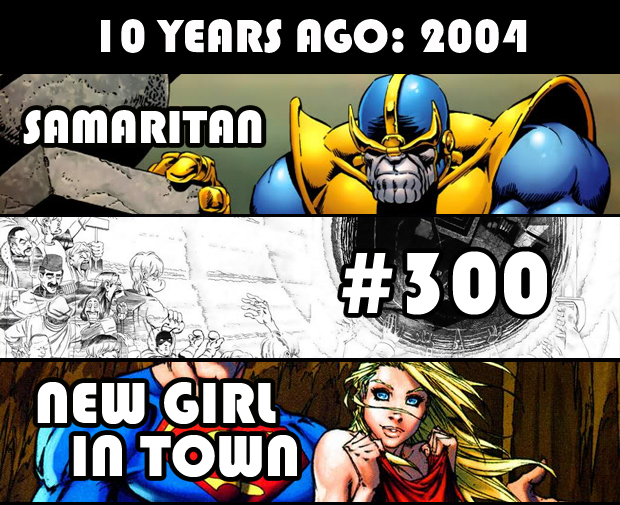 The six part ‘Samaritan’ story introduced and re-introduced various elements that would lead readers to Annihilation, a new Nova series, Annihilation Conquest, Guardians of the Galaxy, the Thanos Imperative and more. I follow Giffen pretty much anywhere he wants to take readers, and I was immediately hit with how different these issues were from previous Thanos eras, including the first six Jim Starlin issues that led into this storyarc. It felt good to be given a chance to read Marvel Cosmic with less existential and more space opera/adventure tones. I’m excited to arrive at these issues once more whenever I reach them in my great Thanos/Hickman Marvel reread. #300! Dave Sim’s monumental Cerebus run reaches its final issue. 300 self-published issues. Amazing. NEW GIRL IN TOWN! Jeph Loeb and Michael Turner and company reintroduced a new Kara Zor-El into the DC Universe with Superman/Batman #8. The Loeb Superman/Batman run was a favorite at the time and DC used the popular series to give Superman a cousin once more. Eventually a new Supergirl graced the DC Universe and I think we were better for it in the long run. If you haven’t read the comics, this story was adapted into the Apocalypse direct-to-dvd animated movie in 2010. It follows the storyline almost perfectly and gives a good sense of what was in those pages. OTHER: Christopher Priest’s 14-issue Captain America/Falcon series begins with Bart Sears art; the Fantastic Four meet Jack Kirby in heaven in issue #511; Kinetic #1 hits, another DC Focus title; Chris Claremont and John Byrne reunite (kinda) in JLA #94 for the 6-part ‘Tenth Circle’ story (Tenth. X. Get it?). This story would lead into a revamped Doom Patrol series by Byrne; the first She-Hulk by Dan Slott volume begins; and Grant Morrison wraps up his New X-Men run with issue #154. GREAT LAKES! Mr. Immortal! Dinah Soar! Flatman! Doorman! Big Bertha! 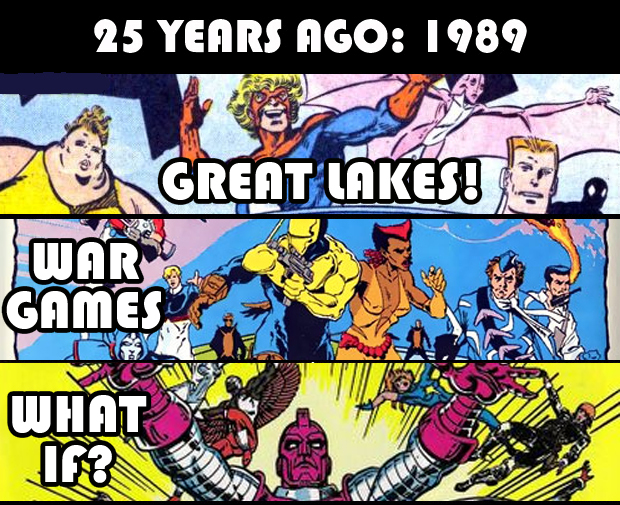 John Byrne gives us the Great Lakes Avengers in West Coast Avengers #46! WAR GAMES! Checkmate #15 kicks off the 11-part ‘Janus Directive’ crossover story featuring nearly all of DC’s government agencies and super agents. While the premise seems to have incredible potential, it’s a bit of a mess by the time you get to the final chapters (although I still remember and read it fondly). The story involves Amanda Waller, Task Force X and the Suicide Squad, Checkmate, the (Captain) Atom Project, Sarge Steel, Firestorm, Manhunter, the Force of July, KOBRA and others. There’s no collection of the story but you can find the back issues for cheap. WHAT IF?! A second volume of Marvel’s alternaverse begins – not as fondly remembered as the first volume, but a few stands outs here and there. NEW LOOK! The entire Batman mythos gets an upgrade – including the yellow oval around his emblem – in Detective Comics #327. Led by Julius Schwartz, John Broome and Carmine Infantino, this issue is credited in DC’s initial Who’s Who volume as the first appearance of the Silver Age Batman (the version that is a member of the JLA, leader of the Outsiders, fought in the Crisis… etc.). Even though this was meant to be the start of the initiative, Batman’s new look hit the stands a few weeks earlier in March in World’s Finest #141. These stories would return the character to his detective roots until the success of the Batman TV show in ’66 brought back the campier elements. The first Showcase Presents: Batman volume begins with this issue. MYSTERIO! Spider-Man fights the enigmatic Mysterio for the first time in Amazing Spider-Man #13! OTHER: Starting with Adventure Comics #320, the letter column for the Legion of Super-Heroes is named the ‘Legion Outpost’ – a popular name associated with the future team; Captain Storm is introduced in the first issue of his own 18-issue series. He would eventually join up with other military type characters to form the Losers; Aquaman #15 has a story titled “Menace of the Man-Fish” featuring a scientist that goes mad when he gives himself the ability to breathe under water. He starts to construct an underwater city and tries to populate it with kidnapped surface dwellers but is eventually stopped by Aquaman, Aqualad and Mera. I’m mentioning this because it sounds like it could be the inspiration behind Will Pfeifer’s ‘American Tidal’ storyarc that also started in issue #15 of the 2004 Aquaman series (featured in last month’s Timeline Tuesday) and features a submerged city, underwater breathers, etc. It’s probably coincidence, but the match in issue numbers is a fun connection. ALL-AMERICAN COMICS! The Golden Age anthology title begins! This title would introduce the Golden Age Green Lantern, Red Tornado, Atom, Dr. Mid-Nite, Sargon the Sorcerer, Ultra-Man, Solomon Grundy, and others to readers. The flagship title, characters and parent company would be sold to its partner company, National Periodicals (DC) in 1945. It would eventually change to All-American Western in ’48 and then to All-American Men of War in ’52. Probably fair to say that it’s an important title in the development of Golden Age DC history. OTHER: Action Comics #11 features the first use of Superman’s X-Ray vision; released by Fox Publications in response to the sales of Action Comics, Will Eisner’s Wonder Man character hits the stands for only one issue. The company was immediately presented a lawsuit by DC Comics stating that the Wonder Man character, who used a ring for his abilities, was too similar to Superman. The case went to trial and was judged in favor of DC Comics. The title would change its name to Wonderworld Comics with issue #3 and the Wonder Man character was dropped for a new character called the Flame. Apparently, this turn of events is chronicled loosely in Will Eisner’s the Dreamer. Sounds like the character is deserving of some kind of resurgence – in a Miracleman/Sentry-esque retelling. I was curious about WONDER MAN and found a scanned copy of the first issue: http://goldenageheroes.blogspot.com/2008/08/not-so-original-wonder-man.html. I wonder if they ever produced those promotional rings that were mentioned at the end of the story? I’m guessing not. This is a great find! Thanks for that!